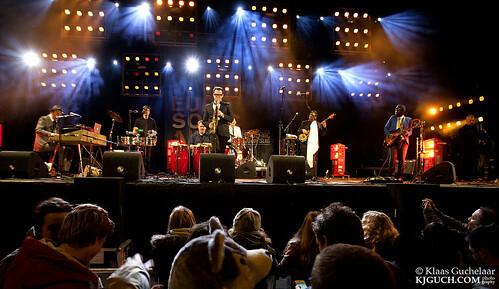 As luck would have it I was not about to get to see a lot of Eurosonic this year. Busy plans at work and on top of that I fell ill on Friday afternoon and that kept me away from the full Saturday planning as well. I did however finally get to see Kyteman Orchestra on the open Air stage (probably further aiding to my getting the flu) and the ever fabulous New Cool Collective. 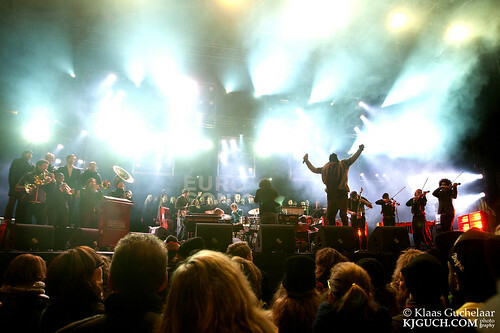 Colin Benders -the brains behind Kyteman- disbanded his Hip-Hop orchestra after a year of touring, but last year he returned with a new formula: Kyteman Orchestra!. Combining his Hip-Hop band with a huge choir, the sound got a lot heavier. At times it’s more a classic orchestra, and sometimes it’s pure Hip-Hop and rap, all sewn neatly together by a terrific live band with a brass section, a string section keyboards, bass and pianos, drums, glockenspliel and a set of timpani. Really impressive! Great way to kick off the festival, cold as it was. The crowd loved it. Next up was my all time favourite jazz band New Cool Collective. Not as a big band this time, but as the tighter set, however one change was obvious: guitarist Anton Goudsmit was not present, he was replaced by Rory Ronde (or Kofi Anonymous). And it was good. A bit of fresh air so to speak. Also Rory is a lot easier to photograph, so no complaints here :) But music is where it counts and I loved it. Benjamin Herman and band were in fantastic form, had a great time. So short as it was this year, I did at least get to see two bands I really love. Didn’t get to discover any new bands as I’ve just recovered enough to get some work done on the photos.